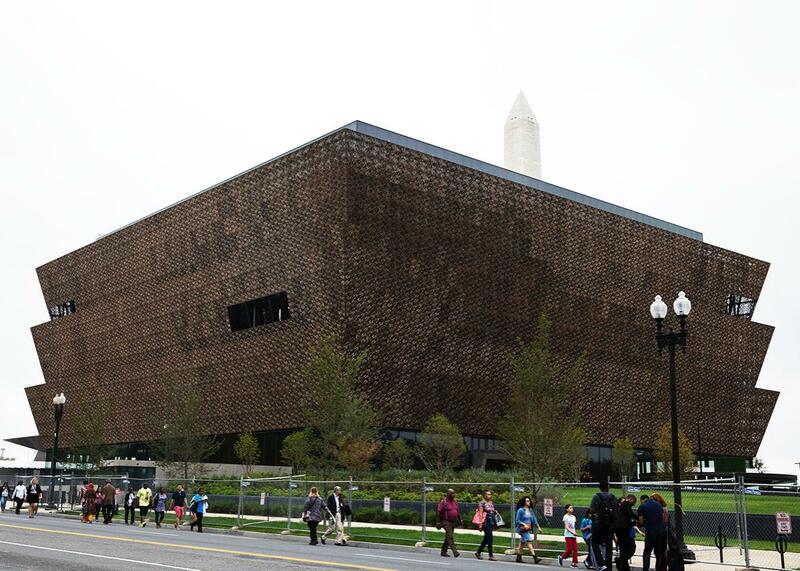 The successes and failures of the Smithsonian African American Museum. The many small successes, and one large failure, of the Smithsonian’s National Museum of African American History and Culture. The opening of the National Museum of African American History and Culture on Sept. 24 in Washington, D.C.
She smiled at a photo of Barack and Michelle Obama fist-bumping, then asked about an accompanying image of black soldiers dapping in Vietnam, described as a “gesture of solidarity.” She recognized the “gestures of dismissal” even if she didn’t know Real Housewife Nene Leakes or the fictional wife Claire Huxtable. And she spent a lot of time on the gestures of protest: Black Panthers with fists raised; Michael Brown Sr. doing Hands Up Don’t Shoot; and Tommy Smith and John Carlos raising their fists at the 1968 Olympics. “That’s like that football player,” she said. She doesn’t care about sports but Colin Kaepernick has recently been a topic of discussion in the sixth grade. It was clear from her questions that it hadn’t occurred to her that gestures were something you would ever think about, much less something that could contribute to a culture—or, for that matter, end up in a museum. The photos opened my eyes, as well, to lines of influence I hadn’t considered before, between the double-dutch and the acrobatics you see in subway cars, between the gestures of worship and the gestures of protest that submit to a higher power—one sincerely, one with bitter irony. The exhibit on gesture is a small part of a collection devoted to “Movement: Gesture and Social Dance,” itself a subdued portion of the museum’s flashy culture exhibition, which includes the P-Funk Mothership, one of the impossibly tight dresses from En Vogue’s “Hold On” video, and rooms devoted to black film, black comedy, black theater. (“They must not have had time to include Hamilton,” my daughter observed, “but I bet they add it soon.”) Like every feature of this remarkably rich and dense museum, the exhibit is the product of a great deal of care and thought, and rewards inspection and contemplation. That density and richness, though, is proving an obstacle in the museum’s early days. Despite timed tickets—about 7,000 a day—controlling the inflow of patrons, the museum was unmanageably packed on Saturday. (And that was after you navigated the extensive entrance and security lines outside the museum.) In part that’s because the overwhelming amount of material—artifacts, captioning, and especially the extensive use of video—encouraged visitors to stop and watch, stop and read, stop and ponder. That’s what you want a museum to do, of course, but when those visitors are packed into narrow corridors, it leads to traffic jams, jostling, and a lot of obstructed views. One reason the third- and fourth-floor culture galleries were so crowded on Saturday was that they were actually less crowded than the rest of the museum. The upper-floor galleries were the only part of the museum you could walk into; by noon, the underground history galleries were essentially impassable. 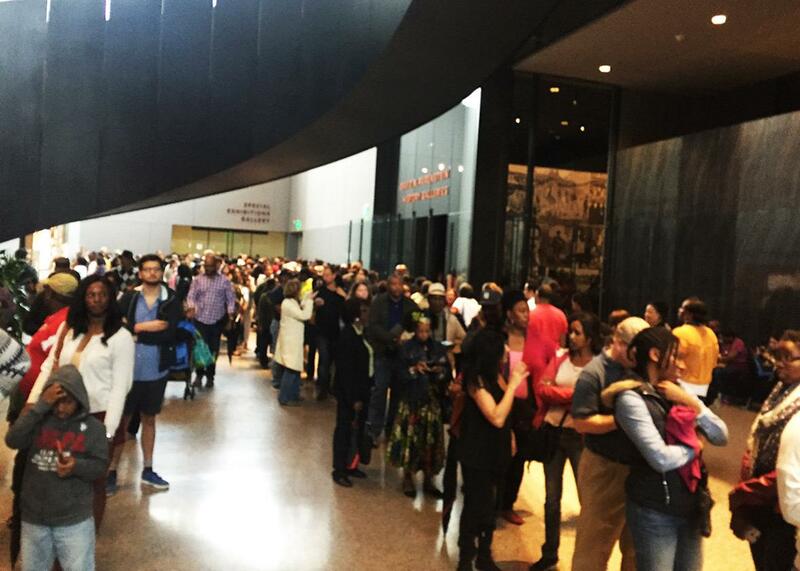 “There’s a two-hour wait for the history section,” harried staffers announced through portable PAs, and the line for those galleries packed an entire museum floor, unguided by ropes or cordons of any kind. Outside the history galleries on Saturday afternoon. This single, directed path, from the depths of slavery up to the present day, is a great way to design a museum if you don’t intend for many people to visit. (It must have looked terrific during the board of directors’ walkthrough.) It strikes me as a catastrophically restrictive way to design a museum that is going to be hugely popular for the foreseeable future. Is there a solution? It’s hard to imagine one in the near term. The crowds reflect the belatedness of this museum, the long decades during it ought to have existed but did not. It runs counter to the museum’s democratic mission to restrict attendance further, though to do so would make it a much better experience. I asked the museum’s press representatives what steps are being undertaken to improve traffic flow and ameliorate the crowds, but they didn’t respond. Starting Sunday, the museum stopped issuing same-day tickets, a move that will reportedly keep out a quantity of guests “in the hundreds” each day. (You can buy someone else’s advanced ticket on Craigslist for a cool $20, though.) After the first year, I can imagine the crowds thinning out a bit; until then, if you’re thinking about visiting, you might want to book for the earliest entrance time. Unlike, say, the typical Smithsonian Saturday museum crowd, very few guests to the NMAAHC are casual browsers whizzing through for an hour before lunch. Again, that is a credit to the museum, which has assembled an incredible quantity of artifacts and interpretive material, and guests, many of whom planned this trip months ago, understandably want to take their time. But contemplation, surely the goal of every museum experience, can be hard to come by when you’re exhausted just from navigating the space, and when thousands of other visitors are pressing at your back. As we ate lunch at the café, we shared a table with a pair of middle-aged sisters and their elderly mother. The experience of visiting the museum ought to have been a triumphant, joyous one for her, but she slumped in her seat as her daughters discussed whether it was worth it even to get in line for the history exhibit. She’d been waiting her whole life to see a museum devoted to her cultural experience that was this beautiful, this emotional, this comprehensive. It’s a shame the museum was making her wait hours more.